School Board President Brian Nolan said Wednesday that members could not speak about Superintendent Anna Hunderfund, who was placed on paid administrative leave last month. 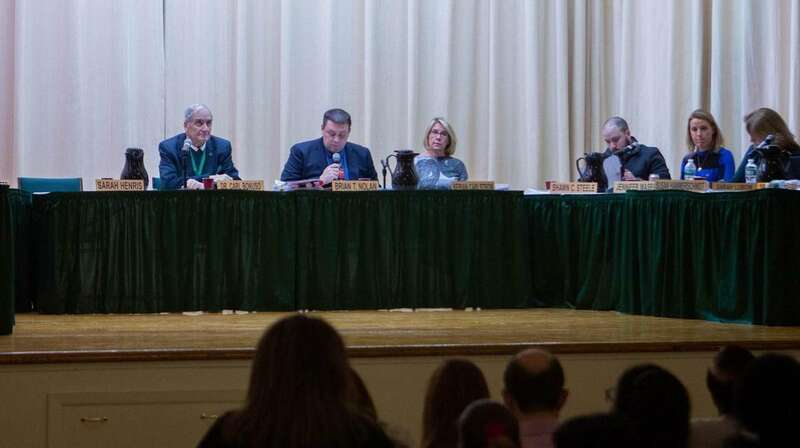 Parents of current and former Locust Valley Central school district students called for information Wednesday about the decision to place the district's superintendent on paid administrative leave for reasons that school officials have not made public. About 150 people showed up at Locust Valley Intermediate School, many to support Superintendent Anna Hunderfund, at the first school board meeting since the trustees unanimously voted to place her on leave last month. Some questioned the actions of the school board during a public comment period following a closed executive session, with many demanding answers as to why Hunderfund was removed while officials review the case. Hunderfund has said she could not comment because of pending legal issues. Finances were on parent Amy Driscoll’s mind when she stepped up to the podium to ask how the district was going to fund the salaries of two superintendents, in addition to paying for the services of a law firm and a public relations firm. “I’m asking how are you going to pay for this decision,” she said. In Hunderfund’s place, school board members installed retired Hicksville schools superintendent Carl Bonuso at the helm of the 2,000-student district. It was unclear how much he was to be paid. With an annual salary of $385,297, according to recent data supplied by the New York State Teachers Retirement System, Hunderfund is among the highest paid administrators on Long Island and New York State.